An almost-ready, boy-flavoured, small one is soon to arrive. The Pebble vest provided the most excellent of knitty therapies this weekend. The yarn is a soft and tweedy Jo Sharp and in an unprecedented planetary alignment there were precisely enough matching buttons in the button jar. I did think a good, hearty, birthday giveaway should be the order of the day. Any requests? Love the vest, lovely colour and great buttons. Wow, birthday coming up.. don't worry too much about it! :) We're all in the same boat..
vest is fab and so are you and soon to be even more fabulous and *ort*. Didn't want to type it in case you are not ready to see it yet. Oh my what a delicious little vest - I love it! Very nice, distracting vest. I think you are one year up on me. I'm suggesting a giveaway that will distract from the school holidays.. Sounds like you could prehaps do with giving away one or two of your children?!! Love the vest and good luck with the school holidays (and a sly Happy Birthday to you too). How can no one be venal enough to have asked for anything yet? The vest is super cute. Yet to knit this pattern. Great vest - NZ school holidays start next week - so no doubt I'll be in your position soon. I reached that certain milestone last year - so hope yours will be a great day. Giveaway request: one of your fabulous scarves with fabric threaded through. Love the buttons! They are perfect! Yep, an Easter chook (bustin-out-a-move version) would be a good giveaway. When I turned 40 I went back to university, bought a mudbrick house in the dusty hills and took up the cello. All within the space of two weeks. Midlife crisis? I haz it. That vest is super cute and the buttons are a nice touch. Comment no 1: Gorgeous vest. 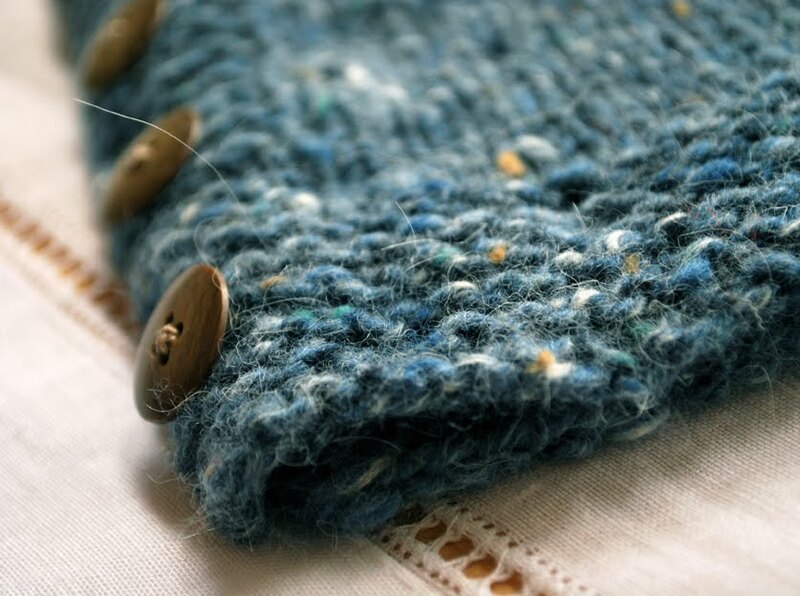 Love tweed yarn. Comment no 2: "School holidays" They are dirty words in this house. I might join you in the sand pit. Comment no 3: The thirties? I think I remember them. But your forties are fun and fabulous, girlfriend. Love that vest, lucky ducky who sports that. Birthday Giveaway is easy- a dinner date with you!! PS not that you in anyway look like a chickie. 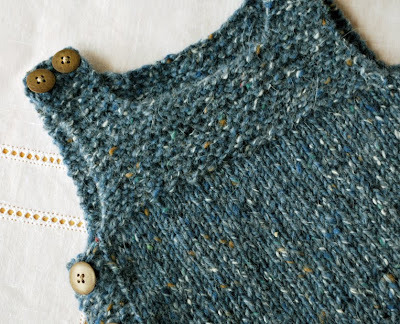 Love the little vest, the yarn is beautiful. You have this art/craft thing in the most amazing place. I have remembered posts from long ago, of yours, and that is saying something as I constantly need to retrace my steps from one room to the next to remember why I came. 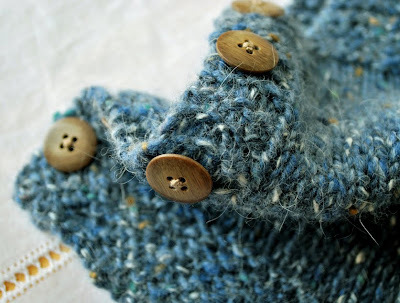 I really love your sense of whimsy and the absurd....I will make the vest also, I am doing some knitting for KOGO and toys for Mirabel......hand in a splint at present owing to my exessive enthusiasm. I will look forward to your future blogs. Pebble vest looks lovely and pebbly. Mrs Pea soup has the idea. I'm sure I could find a mud brick number for you around here!! As for jo sharp....geezzz she knows her wool. As for the vest...must make one..must make one..will I ever get around to making one? 1. I have never seen a Pebble that I didn't like and that didn't make me want a new tiny one of my own. 2. Hmmmm you should see the ste of my house after one day. Help?? 3. I'm running as far away as is possible while not leaving the country for mine. smashing bit of knitting there! I haz one of those coming in July. You have achieved much, so I say celebrate. Giveaway? I'm still gutted I didn't win the one from last year - those colours were so me!!! Hmmmm. Giveaway...... so much to choose from....... I vote something printed with something knitted. both for the cooler months. Perhaps a tea towel for the kitchen (where we tend to stay close to in the winter) and a scarf or beanie for warmth while we craft. Ahh, forty schmorty. Who cares. Embrace your age. I'm forty three, and intend to keep behaving in a very childish manner for a very long time to come. As for school holidays, it's a catch 22. Love all the extra time not spent ferrying kids around, but could happily bang fighting heads together. Just gotta make the best of it. Well.... anyone who knits the best looking Pebble vest I've ever seen needs to have a party..... for the vests' sake of course. Loving the blue, loving that you have a button jar..I have an old tin and don't think I would even have a matching pair in there so well done you! Gifts? ooooO I want a dinosaur egg please. Seriously? The 40s? They are awesome. They really are. Best decade EVER. So you're entering your 20s then, right? That's not so bad! You are just a little older than me. Ha! Apparently it's good on the other side. Very good. I love that vest, it's beautiful. How long did it take you? I think I'm getting mildly jealous of your crafty speed! love that pebble vest - nicely shot too! gluck is all i can say! the vest is gorgeous....the holiday is LONG, thankfully my 3 boys went back to school yesterday, I am breathing in the quiet. I too will be leaving my most beloved thirties this year, so I will clap my hands along with you...I love living in la, la, la land. woah. i want to send you a birthday wish. that is a big one, and the lalala approach sounds wise wise wise to me. that's what i'm doing about these crazy lines around my eyes. i mean, i'm trying so hard. lalalala. daivd pointed out to me last night, that it's the shadows that make face lines apparent. so it's all about the lighting! gonna be focusing on the lighting from now on. get those shadows in the light. yeah. happy birthday tania, a little early....love you!!!! you are such a good inspiring funny blog friend. so how do i get your address to mail you a birthday wish?? oh. the vest! i LOVE the vest. and hey~~ my olearia sweaters are looking good! doing two at a time. thanks so much for turning my head toward that pattern. Don't panic , there is life after 40 . You just have to embrace the walking frame/Stena staircase/false teeth in a glass by the bed/housedress lifestyle . You'll love it ! Giveaway? Another year of hugely enjoyable blog entries please . oh happy days you! lovely vest. ah - hope the cake is sensational to the level it needs multiple cups of hot hot tea. love love love the wool - it does indeed look soft and smooshy. As for school holidays - oh I'm just so relieved I don't have to think of lunches and uniforms and pick ups and drop offs and "shouldn't you be doing homework or reading or something constructive!" Instead, we're all home, mooching along, chilled out ... but we do only have one so I'm sure that's a whole lot easier. Except that when entertained is required - we are the entertainment! It's beautiful Tania - you are so clever, and that colour, what can I say? Perfection! Such a cute knit! Nice touch with the buttons. Good luck on the transition out of the threes and into the fours. I found being heavily pregnant an excellent distraction from the event myself, but I guess that takes some lead time. And would be unlikely to make parenting any easier. Giveaway? It is us who should be giving to you, oh inspiring & entertaining crafter! the yarn and that vest will look amazing on a boy flavored little one. focus on the smell of sweet baby head and your own age might not matter as much (maybe? ).